2015 will be remembered for many important initiatives and developments, from the body’s work to support human rights in Sri Lanka to the creation of a new Special Procedures mandate on the right to privacy. 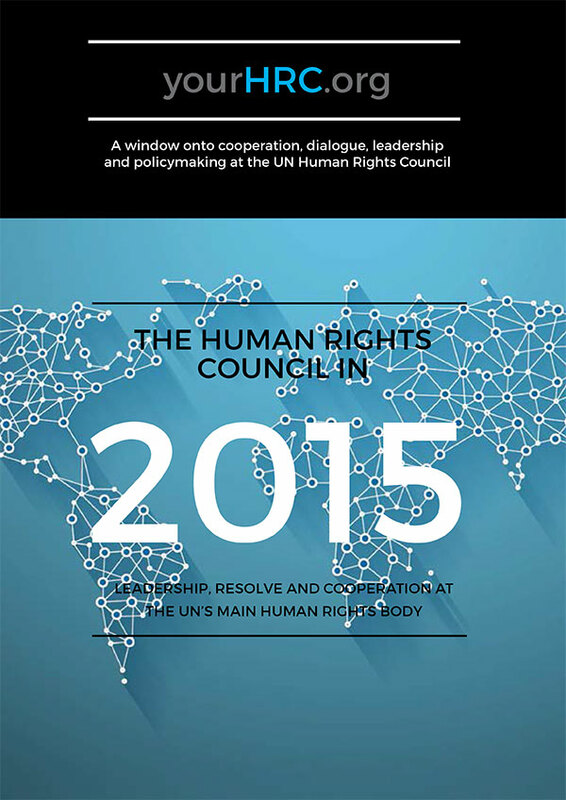 This new report on ‘The Human Rights Council in 2015,’ published by the Universal Rights Group and the Ministry of Foreign Affairs of Norway as part of the yourHRC.org project, offers an at-a-glance summary of the work, output and impact of the Council, and the engagement and leadership of its Member States. It is likely that, in years to come, people will mainly remember 2015 as a year of efficiency drives, of nascent efforts to tackle the international ‘implementation gap,’ and (towards the end of the year) of a re-emergent recognition of the importance of prevention in the UN’s human rights toolkit. Over the course of the year, the President and the Bureau probably devoted most attention to the first of the three ‘baskets’ – efficiency, and, as we look back at the year now ending, it is clear that their efforts have borne some important results. For example, the calendar year witnessed the first sustained quantitative contraction in the output of the Council since the body’s establishment in 2006. The number of resolutions adopted at the 28th session in March (37) was 12% lower than during the corresponding session one year earlier; and the 29th and 30th sessions likewise saw drops of 24% and 11% respectively (compared to the corresponding sessions of 2014). Overall, 2015 saw 95 resolutions adopted, 15% less than the number adopted in 2014 (112). Linked with the drive to develop more efficient and effective methods of work, 2015 also saw some important innovations in the way the Council operates. Taking forward ideas incubated during informal retreats and dialogues in Berlin, Geneva, Glion and elsewhere, a range of actors introduced new and improved ways of realising the Council’s mandate, including, inter alia: Informal Council Briefings by the High Commissioner; Enhanced Interactive Dialogues; country-specific Panel Debates (on the situation in North Korea); and ‘hybrid’ resolutions (i.e. texts focused on specific thematic concerns within a geographically-defined situation, such as, for example, the Organisation of Islamic Cooperation’s resolution on the rights of Rohingya and other minorities in Myanmar). Key goals of these rationalisation efforts, and of associated innovations in the Council’s working methods, were to create space for States and NGOs to focus on new and emerging human rights challenges, and to enable the Council to become more effective and thus move to fill the long-standing ‘implementation gap’ – the difference between international norms and local reality.